DiGiCo launched a new DMI-MIC Pre-Amp Card for its S-Series digital mixing consoles, offering additional connectivity. The S-Series has already benefitted from an increase from 40 to 48 flexi channels as part of a recent update, and the new DMI-MIC Pre-Amp Card adds an extra eight mic inputs, connected via a 25-way D-sub, using the same great pre-amps already found in the console. This also allows for up to 40 mic inputs directly on the console surface. DiGiCo consoles are used on many live sound tours and events around the world and the launch of new, compact S-Series made this pedigree of audio performance available to every part of the industry, with Stealth Digital Processing introducing a new standard of audio quality, power and flexibility not seen before at its price point. The S-Series multi-touch touch screens, breaking the mould for small format consoles, with up to 31 faders, 96kHz processing, Internal FX and bundles of I/O. 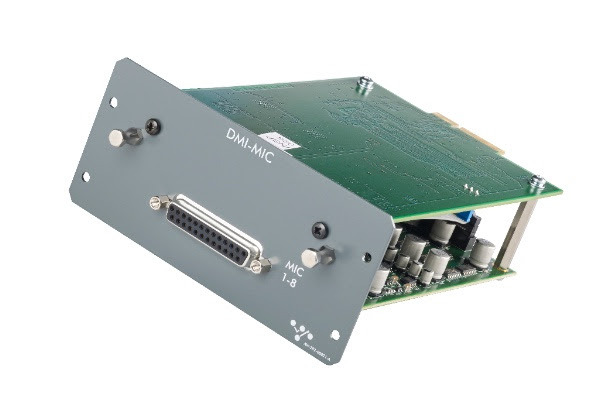 With plug-in DMI cards the S-Series can operate in a wide variety of environments by adding extra I/O or connectivity options, including MADI, Dante or Waves SoundGrid.